If you’ve got beef with someone…..get it at the Gaucho! The Gaucho is London’s premier Argentine restaurant. Renowned for the cuts and quality of meats – all of the meats are grass-fed, organic, and imported from Argentina – your experience at Gaucho will be quite simply outstanding. 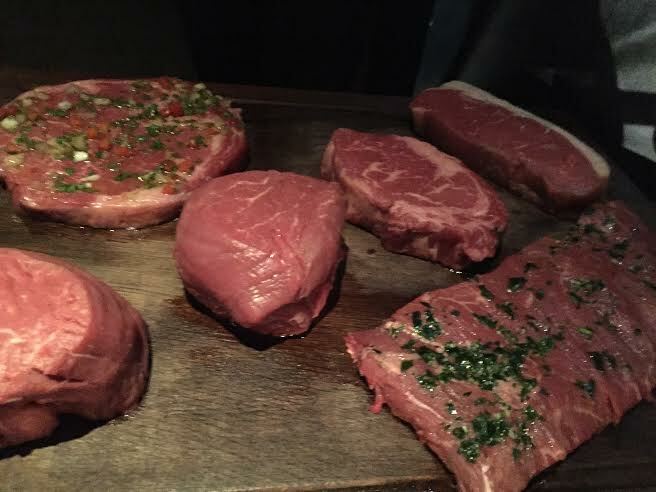 We visited The Gaucho on Sloane Avenue in Chelsea, London. Upon entering, we were greeted with some of the friendliest hosts and waiters we’ve encountered in London. 10/10 for service. We loved the interior décor – a cool, suave black palette, with all of the (oh-so) comfortable chairs clad in black and white cow hide. We loved how the cowhide concept had been extended to the rest of the restaurant – cowhide was hung, kilim-style, on the walls and decked out in other more unusual places. To start off our Belshazzar’s feast of a meal, we started with the provolone plate and a beef and, respectively, tomato and mozzarella empanada. The empanadas were cooked to perfection – crispy yet soft, with the delicate meat and cheeses inside presenting strong and delicious tasting notes. The tomato and mozzarella, in particular, was a homage to Italian pizza, denoting the influence the Italian diaspora have had on Argentine cuisine. The provolone was creamy and incredibly moreish – a dish that is not to be missed! Our main course was equally substantial and exceptional. We chose the tira de ancho and the chef’s churrasco de lomo, accompanied by sides of spinach and beans. Both cuts were exceptionally tender – enough so that the meat was very easy to cut and even easier to digest. The chef’s special, the churrasco de lomo, was marinated in a parsley and garlic dressing, allowing for the juices of the meat to mingle spectacularly with the light herb dressing. The result was an irresistibly juicy concoction. The tira de ancho was equally tender. We loved this cut of meat for its natural flavour – which is a sign of the quality of the meat. We also loved the choice of dressings that were provided – from Argentine classics such as Chimichurri and salsa verde to the velvety Bernaise. Suffice to say, both steaks, whilst 400g each, were rapidly devoured! All of this was washed down with a Malbec, Selección G’ Bodega Fabre, 2017. Whilst a young wine, the light and carefully balanced flavours were the perfect match for the hearty steaks, allowing for the flavour of the meat to stand out. Whilst the steaks were undoubtedly the piece de resistance of the meal, it would be remiss not to mention the desserts. We tried the Dulce de Leche Cheesecake (Hot, salted dulce de leche and toasted marshmallow) and the Chocolate Truffle Torte (Dulce de leche, chocolate candy, broken cantuccini biscuit and alfajores ice cream). Both desserts were mouthwateringly delicious without being overwhelmingly sweet. If you’re looking for exceptional service, an unrivalled location and exquisite food, then The Gaucho should be on your radar.